Our Krazy Kitchen has been so much fun, but with life so busy, trying to maintain posts on two blogs can be a bit daunting. Perhaps there will be a post or two every now and then here, so please keep us bookmarked. 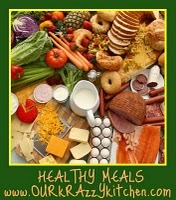 This is a great resource for recipes of all kinds. In the meantime, please come by and visit me at Forgetfulone! I will even have some occasional posts about recipes and eating healthy. Thanks to 3 Sides of Crazy for your cooking expertise and for allowing me to blog at OKK! This is a fantastic low calorie tasty salad. 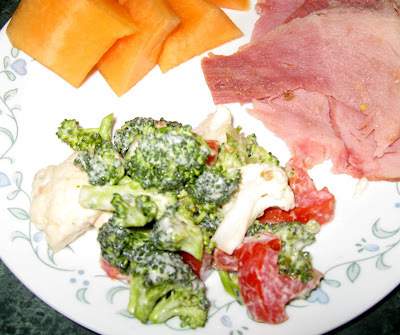 I used to make the super fattening broccoli cauliflower with tons of mayo, sugar, sunflower seeds and tons of bacon. Delicious yes, but so fattening, you can eat such a tiny portion compared to this salad. The red wine vinegar is so good in this. It’s a nice make ahead salad but I wait until about an hour or two before serving time to add the dressing. 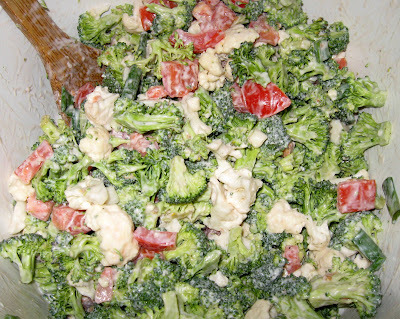 Dice tomatoes, chop broccoli and cauliflower. Mix veggies together in a large bowl. Mix mayo, sour cream, salt and pepper, Splenda and red wine vinegar together in a small bowl. Add to veggies. Stir thoroughly and refrigerate for 1-2 hours, stirring often. Keeps in the fridge for about 24-36 hours nicely in my opinion. It really always comes back to comfort food, doesn’t it? I like this recipe as it comes together pretty quickly. It uses canned soups which certainly can be helpful when short on time. This is my take on Jenny’s recipe, you must check out her recipes, she takes the most amazing pictures. I do increase the ranch from the original recipe. I love ranch and I think it adds an awesome flavor. However, my husband says that it is a bit too salty. Ranch is salty. I happen to love salt so this isn’t an issue with me. So keep in mind before adding extra salt besides the ranch if you are sensitive to salt. Place shredded cooked chicken in large bowl. Sprinkle in 3 tablespoons (or 1 packet) of ranch dressing, salt and pepper. Toss to combine seasonings. In a large pan, saute onion for about 5 minutes until soft. Place soups and milk in pan and whisk until combined. Stir in mixed veggies and then shredded chicken. Transfer to a 9 x 13 inch baking dish sprayed with cooking spray. Sprinkle bacon on top. Open biscuits and cut each biscuit into 10 little triangle pieces. 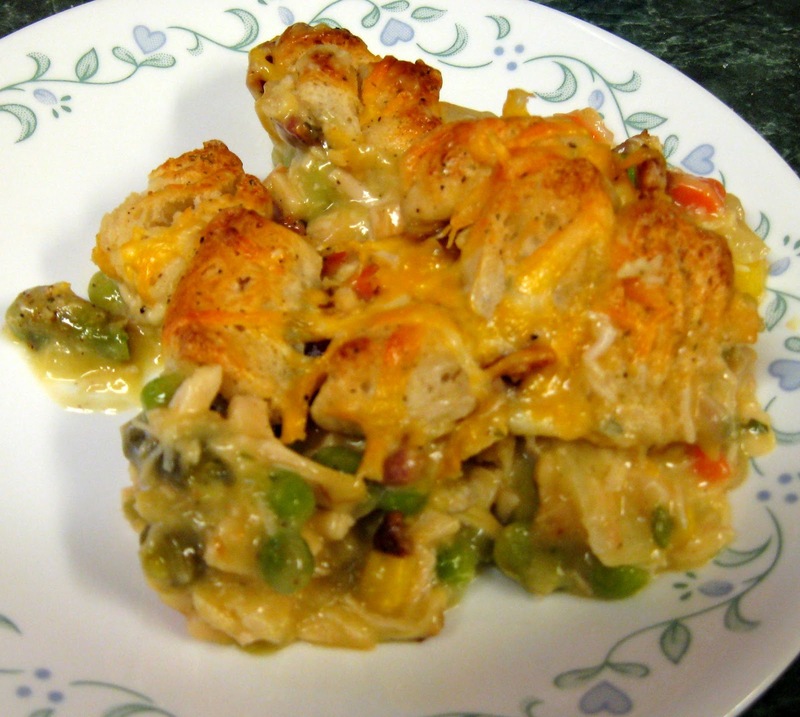 Place little pieces of biscuit over the top of chicken mixture until it’s all covered. Sprinkle biscuit dough with another packet of ranch or about 2 tbsp. of ranch. Sprinkle with garlic powder and pepper. Top with 1/2 cup cheese. Cover and bake for 25 minutes at 350 degrees. Uncover and bake for another 25 minutes or until biscuits are cooked and nice and browned. This is a healthy recipe that I modified from a Pampered Chef recipe from long ago. I only took one photo. This is the pizza going in the oven. I forgot to take an “after” picture! So sorry. This is a really tasty substitute for regular pizza that is usually laden with grease and heavy meats. I hope you enjoy it! Vegetarians should love it, but so do my meat-eaters! 2. Unroll the pizza dough onto a lightly floured pizza stone. Shape into a circle using a rolling pin, adding flour as needed to keep it from sticking. Press the edges of the circle a little thicker to make the crust. 3. Combine Canola Mayonnaise, pressed garlic, and ranch dressing mix in a bowl until creamy. Spread mixture evenly over crust to within 1/4 inch of edge. 4. Sprinkle chopped/sliced vegetables evenly around the pizza dough: brocooli, red bell pepper, carrots, and olives. 5. Top with mozarella cheese. You may add grated parmesan if desired. 6. Bake for 22-25 minutes until edges are golden. Remove from oven and let it stand for about five minutes. Serves four people. 500 calories, 50 carbs, 25 grams of fat, and 20 grams of protein per serving. You know the classic green bean casserole that everyone feels the need to make on Thanksgiving and/or Christmas? Really, the only thing awesome about that casserole is the french fried onions on the top. I could just eat those out of the can. Well, maybe it’s time to start a new tradition and make THIS green bean casserole. You so don’t have to wait until the holidays to make this. I’ll be making it again no matter what the season. These were amazingly delicious! Creamy, cheesy and fresh! The only thing I would change is to cut the green beans in half. I try to control portions and it was hard to cut a portion evenly with the large green beans. Gently steam the green beans until tender but still firm. Place in 9 x 13 pan that has been sprayed with cooking spray. Melt 2 tbsp. of the butter in a pan, add the onions and red pepper and saute for about 5 – 6 minutes. Add garlic and saute for another couple of minutes. Whisk in the flour and cook for 2 – 3 minutes. Whisk in milk, bring to a simmer but not boil. Stir in cheese and turn off heat and stir until cheese is melted. Season with salt and pepper to taste. Add just a bit of nutmeg and stir. Pour the sauce over the top of the green beans. Melt the remaining 2 tbsp. of butter and combine with the crackers and parmesan cheese. 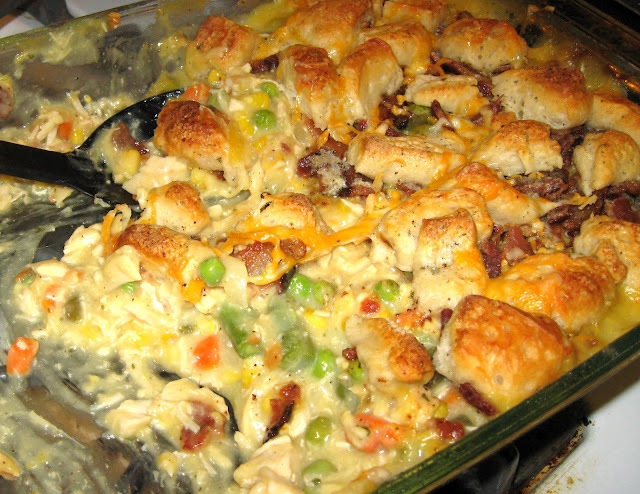 Sprinkle over casserole. Bake for 25 minutes at 400 until bubbly and golden on top. Fresh Vegetables! Is there anything healthier? Sweet, green peppers… Very low in calories, carbohydrates, cholesterol, fat, and sodium. Bell peppers are a GREAT source of vitamin C and dietary fiber. They are also a good source of vitamin A, Niacin, Thiamin, vitamin B6, folate, magnesium, copper, potassium, and vitamin K. Wow! This vegetable really packs a healthy punch! White onions… Extremely low in fat and calories. Great source of dietary fiber. Good source of vitamin C. Manganese, copper, vitamin B6, folate, and phosphorous are also present in white onions. They also contain flavonoids, anti-oxidants responsible for protecting the body from free radical cells. Onions have been used in many studies regarding their ability to prevent certain types of cancers. Fantastic! Roma tomatoes… Fat and calories are almost nonexistent. No cholesterol. Very low in sodium. Excellent source of vitamins A and C. They also contain anti-oxidants. Nice! Fresh cilantro… (also known as coriander) No cholesterol. Very rich in anti-oxidants and dietary fiber. Excellent source of numerous minerals such as calcium, potassium, manganese, iron, and magnesium. Also a great source of vitamins A, K, C, and B6. My family loves the flavor cilantro adds to dishes. It’s kind of a love-it-or-hate-it-herb, but it is definitely beneficial to your health. Now, what to do with these beautiful, tasty, healthy vegetables? My family loves when I add them to a pot of pinto beans. Beans are an excellent source of protein and are very low in fat and calories. My bean soup is both delicious and healthy. You can also add these fresh vegetables to pretty much any soup recipe, chicken, ground beef, or whatever your heart desires. Chopping them fine makes it easier to sneak them into your regular recipes, too, and your family may not even notice. But they will definitely reap the health benefits.